Add a Window to Any Room | BioBrite, Inc.
Office cubicles, mail rooms, basements… any room without natural light and outside views can be difficult to live or work in. Studies show that windows and skylights can lift spirits and improve productivity. Now you can add more light to any room easily and economically with BioBrite products. 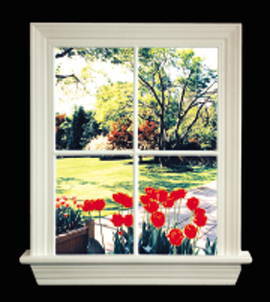 WindowLites are intended for office or residential spaces where you would like to add a beautiful nature view. Enjoy a relaxing view of a beach with palm trees, a colorful spring garden, a fall landscape, or any other scene you prefer. No electrician or carpenter is needed, you just hang them on a wall on a sturdy picture hook and plug them in. 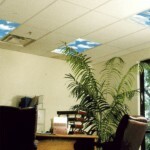 CeilingLites can provide a similar way to create that feeling of being out in nature, this time by adding a skylight. They are designed to fit in standard overhead light fixtures so you can transform a boring office setting to one that feels like you are working under sunny blue skies.